Did you know you could get tie drawers? I didn’t! I guess maybe snazzy businessmen might….I came across this tie drawer and thought it would make the perfect nature table; open and accessible but still ordered so the collections can stay together. We’ve never had a nature table like this before and Jack (3.5yrs) and Sarah (16mths) are loving it. Previously we had our nature collection in jars on top of our playroom shelves, they looked beautiful but were often overlooked, I think maybe because they were a little high up on the shelf. But why have a nature table? A friend of mine queried this when she was over. ‘What do the kids do with it?’ ‘Do they just look at them?’ One of the great things about children is that they haven’t yet acquired our limited adult views; they are still figuring things out. This is something I still have difficulty with; letting go of how things should be played with, their proper purpose, and to be more receptive of Jack’s unique point of view. 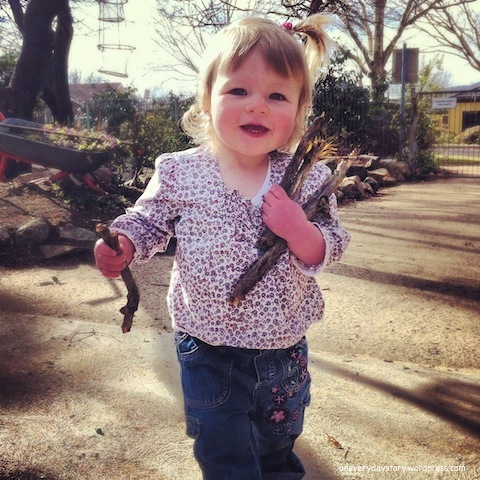 To a child, a gum nut or a piece of driftwood can be anything, do anything. 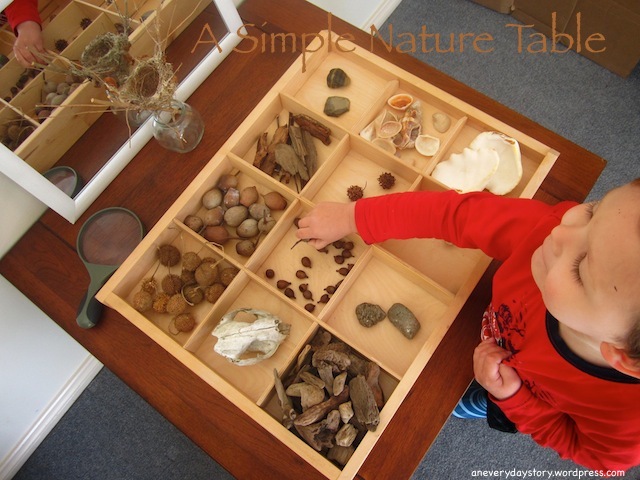 Now that we have the nature table, Jack will go to the table and select different pieces to play with. If he needs some icebergs he will go and get some. If he wants some choc-chips for his cookies he will go and get some of those, too. 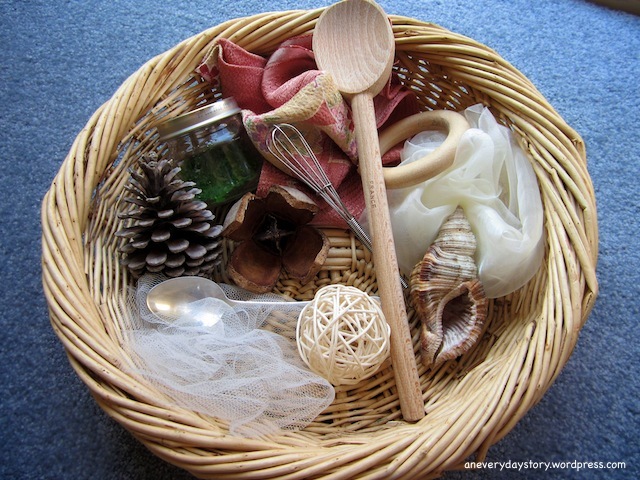 For Sarah, she was introduced to natural materials in her treasure baskets; beautifully textured and waiting to be explored. Or how about some drawing? 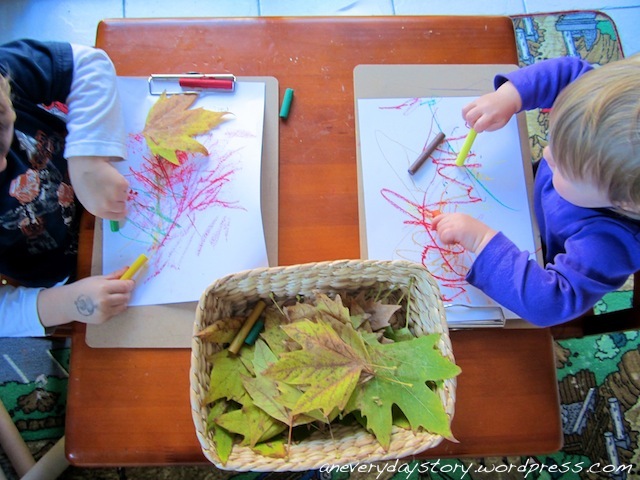 or just some simple leaf rubbings. So many things to do. or a dangerous cascading waterfall. And when you run out of materials, you can always go outside and get some more. 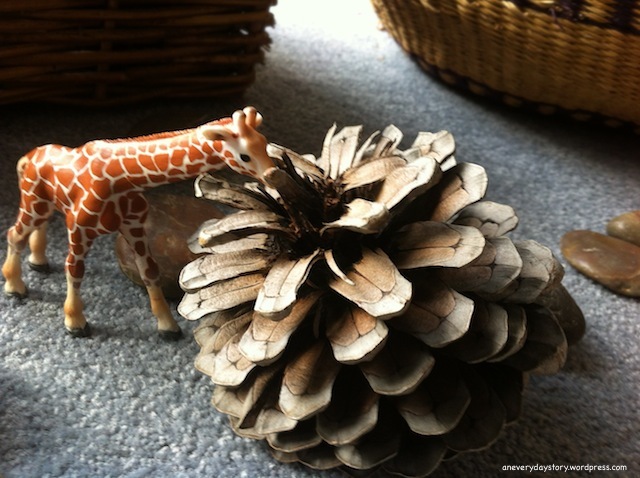 So what do the kids do with the nature table? Anything! Absolutely anything. 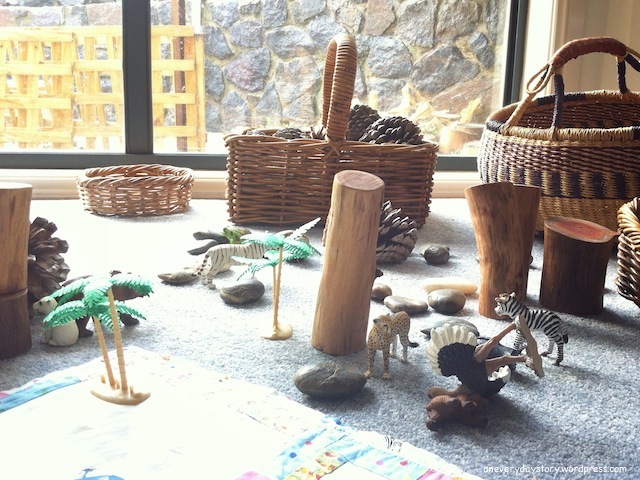 Our nature table is a central space in our home. It is the dedicated place where we put all those treasures from the outside and place them in pleasing ways. Over the years my girls have become very committed to this space in which the seasons are reflected and inspiration gathered. Now they are older it is also where the microscope sits permanently ready for further exploration. That sounds lovely Jacinda. This evening I put a small vase of native Australian flowers next to the mirror. 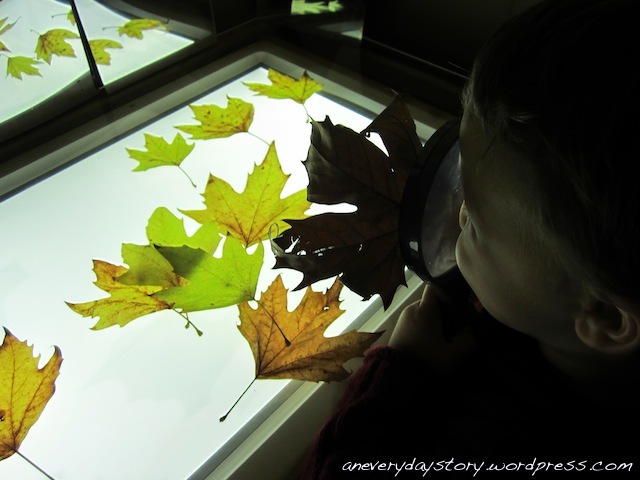 Even though it is a small place, I would really like the kids to take ownership of it and for it to reflect the changing seasons. The kids haven’t seen the flowers yet but I am sure they will love them. I like the way they bring some more life to the room. Thanks Kate. 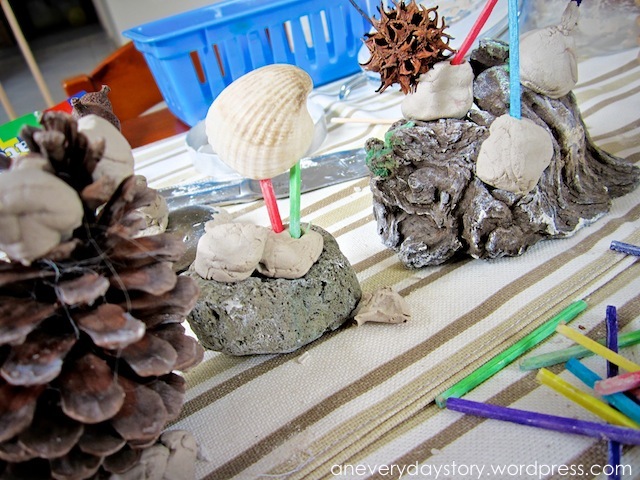 They are all really simple activities but add some beautiful natural materials and they become oh so much more appealing. Where did you get your nature tray? I have been looking for one like this forever, and I cannot seem to find one. I feel it is so much more appealing to display the natural material in this , and much more inviting to the child. Another totally different question. On that picture where both your kids are working on clay impressions, how did you get them to engage in this? You set out an invitation and left it there for them to get into it, or did you, at some point of the day suggested that impressions could be made with the nature material? THis is not an approach I was familiar with when my oldest were younger, and I am not sure how to invite E properly now that he is 2 yo. 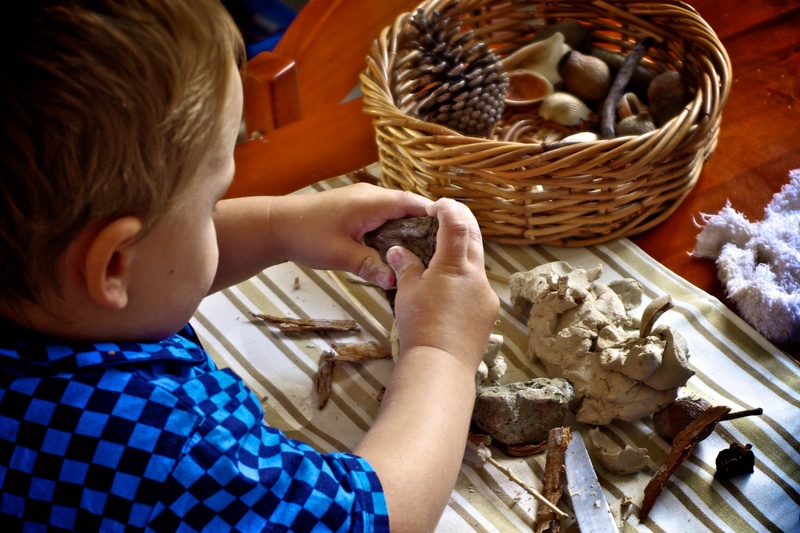 Still much to learn about Reggio! In the picture where the kids are making clay impressions, Jack initiated this activity. 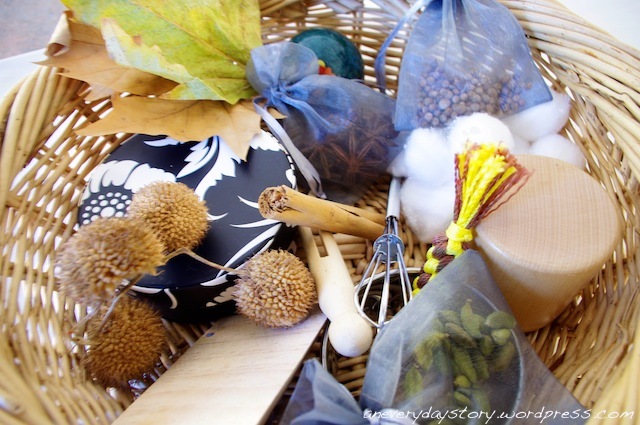 The basket of natural materials was on the art shelves and so he was used to using them for different things. The clay is also on the art shelves. So he got the materials out and did this himself. For a provocation or an invitation though, if I initiated it, I would usually have a subtle suggestion of how the activity could be approached (like have the clay out with just one shell in the clay and the rest in the basket) for the kids to approach if they are interested. I try not to give too much suggestion as to how to approach the activity/experience because I don’t want to stifle their natural inquiry/creativity. 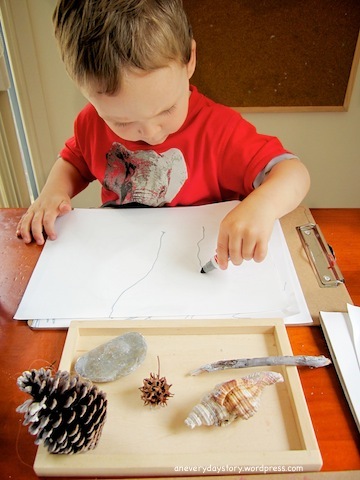 With Reggio, the adults (mentors) try not to give the children the answers, rather give them the means (or suggest ways) for them to continue to experiment and explore in order to find the answer themselves. Someone I knew had the tie drawer and didn’t want it anymore. I am not sure where you would buy one…maybe at a home storage store. But sorry I don’t really know. You are right though, the natural materials are so much more appealing to Jack and Sarah now. 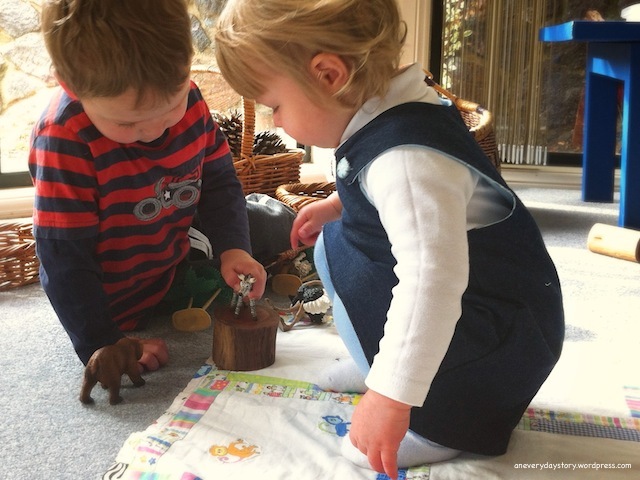 They did play with them a lot when they were in the jars but it was mostly me getting the materials out for them. This way, and since the table is right at their height, they go to the table constantly throughout the day. I love the storage drawer but a cutlery organizer for silverware may be a good substitute, especially for twigs and such. That would work really nicely. I have seen some nice bamboo cutlery organisers at kitchen stores which would look lovely. What a beautiful post, as usual Kate! I love every element of it. I will feature this on It’s Playtime this week! Thanks Deborah. It was a chance find, I didn’t even know you could get them. I was thrilled when I found it. This so wonderful. I am so excited to have found you through the AKBN. 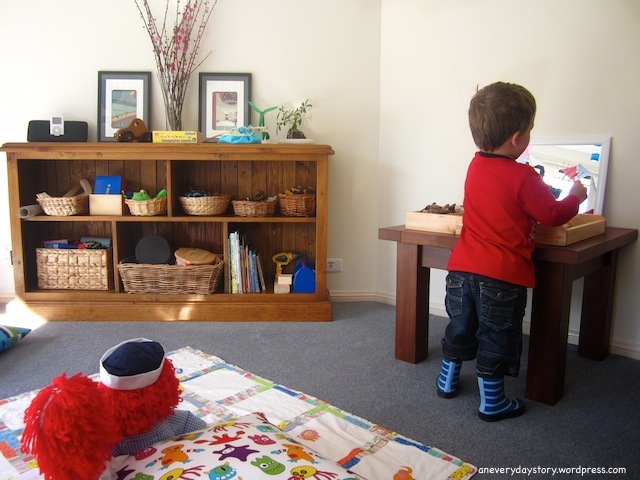 I am setting up our spare room as a play/learning space and want to do something like this. 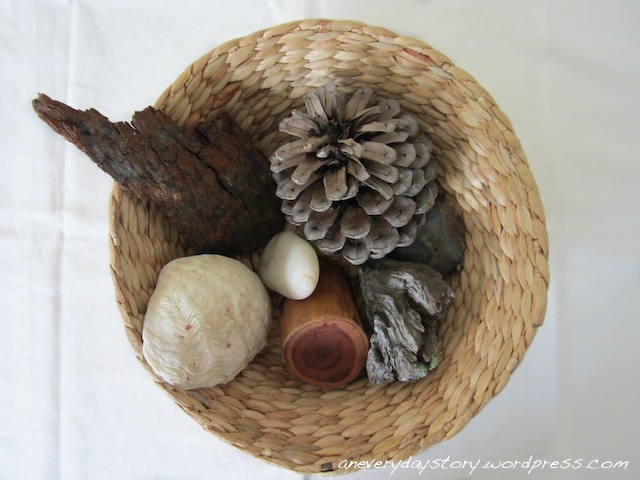 We have lots of wonderful natural materials but they sit in jars and containers in our cupboard and are brought out only for specific projects. I want to set up a table with loose materials always accessible which will hopefully prompt the creativity shown in your beautiful photos. Thanks Ness. It definitely is our favourite place in the house. Although it looks quite different to that now. I think it has exploded slightly 😀 Ours used to be in containers too and the kids didn’t use them as much as I would have liked. Now they use the materials all the time. Sometimes they just carry them around the house . I think they really love just holding them. When you set up a space will you send me a pic. I’d love to see it. What a beautiful post. 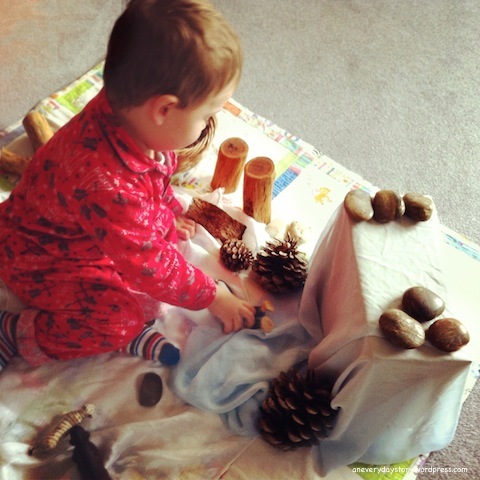 I love the way the whole table centres around the children and the freedom they are given to use the materials. We currently have a small table with a collection of shells but this post is inspiring so we’ll be working on ‘updating’ our nature area. Thanks for sharing. You’re welcome. I have really found that if we keep updating the table with new treasures the kids remain interested in it. They want to play with it more. If sure your kids will love heading out for a walk to collect new treasures 🙂 Let me know how you go. This clay is just simple recycled clay from our local potters’ society. They simply gather up all the off-cuts that people in the studio don’t use and lump it together to sell as recycled clay. It is very affordable too. I think I bought 5kgs for $5. Far cheaper than regular clay and perfect for our needs. Hi! I love your nature table, I have been looking for a sorting box just like your tie drawer – could you please tell me where you purchased it? Hi, what a beautiful idea! I’m looking forward to doing this with my boy when he is a bit older and has stopped mouthing things. 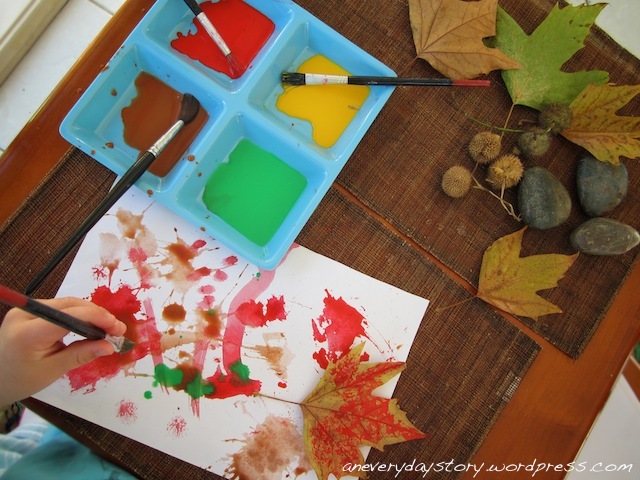 I used this as inspiration though for a play activity for him and linked it back to this post. Hope that’s OK!